Sacred Bones Records has released the first full taste of John Carpenter's reworking of his iconic Halloween theme. The track, which is perfectly called "The Shape Returns," isn't much different from the original theme, but there are some added synthesizers for dramatic effect along with an updated sound, thanks to the modern technology that Carpenter has access to these days. Carpenter enlisted the help of his son Cody and musician Daniel Davies, who the composer has been making records and touring with for the past handful of years. 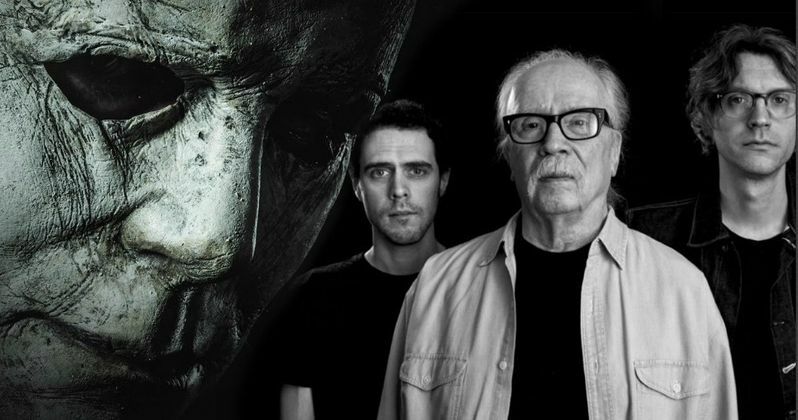 The addition of John Carpenter to David Gordon Green's Halloween was huge news for horror fans. The horror legend was more than happy to offer up his insight during the making of the film, but was a lot more excited to work on the score and devote time to it while Green did all of the heavy lifting on the set. The original Halloween score was thrown together in a few days on a shoestring budget by Carpenter, who ended up changing the musical landscape for horror movies in the process. John Carpenter was a classically trained musician before rebelling and getting into rock and roll music. Though he downplays his chops, Carpenter's unique use of the 5/4 time signature and multi-tracked synthesizers are works of art that have inspired films and music ever since the release of Halloween in 1978. According to Carpenter, the synthesizers were around, and he loved the sound that they made, but they were also easy for him to get symphonic sounds out of due to the fact that he never had the budget to bring in real string ensembles. While composing the score of the original Halloween soundtrack, John Carpenter took influence from German electronic prog rock band Tangerine Dream, who were known for creating long pieces of music that relied on repetition like fellow German pioneers Can. In addition to Tangerine Dream, Carpenter was also heavily influenced by Italian prog rock band Goblin, who composed the score to Dario Argento's 1977 horror classic Suspiria, which is also getting a score reboot by Radiohead front man Thom Yorke this year. John Carpenter's new Halloween score will be released on Sacred Bones Records on October 19th, the same day that the film arrives in theaters. The score pays homage to the original while blazing new trails with more pieces of music, utilizing the latest technology. The latest score is said to have "everything from atmospheric synth whooshes to eerie piano-driven pieces to skittering electronic percussion," which sounds exactly like what John Carpenter fans have been listening to for the last 40 years. Sacred Bones had two colored limited vinyl editions up for sale, which sold out immediately, but black copies are still available, along with a CD version and the digital files. You can listen to the first full track from Carpenter's upcoming Halloween score below, thanks to the Sacred Bones Records YouTube channel.